You might remember him from such periodicals as Architectural Record, Metropolis Magazine, and now Cadalyst! (link) among others. Tab Scott (Terry Beaubois), once again makes big news describing how he uses Second Life to teach Architecture at Montana State University’s Creative Research Lab. The Library Gallery on Info Island will be hosting a two-part exhibition of architectural experiments Thursday, 30 August at 6pm. 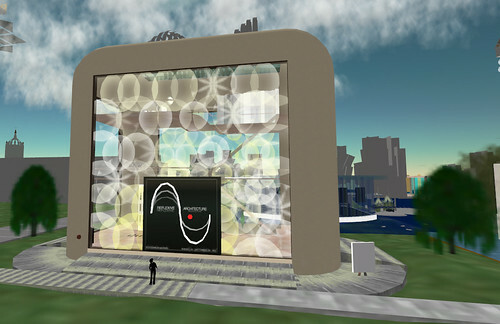 Visitors may teleport to the Library Gallery, or visit the Gallery of Reflexive Architecture to experience the larger models. A reception will follow at the TX859 dance area on roof of the tall building in the NorthEast corner of Info Island. Many thanks to Rookie Voyager, Daruma Picnic and Elizabeth Rookwood for this opportunity and for curating this exhibit! There are a number of statements in this ABC piece on the future of the workplace that I think architects and designers should take note of. A workplace with no corporate headquarters? Not even the CEO has an office with his name on the door? Having a desk with pictures of loved ones is a thing of the past? Who needs an office? So many of these ‘workplace of the future’ pieces seem to focus on the dispersion of the workforce. They refer to these employees as ‘remote’, and describe how companies are rearranging their physical spaces to better accommodate ‘abscence’, de-emphasizing the idea of a personalized workspace, and claiming that there is no longer any need for a headquarters. But is this really a good idea? I think there will always be a distinct value in having the sense of a central headquarters where people gather, and I think the CEO should have a desk. There is definitely value in enabling individual employees to have a space they can customize with their own content – perhaps even pictures of loved ones if they so choose. Just because we no longer occupy the same physical space doesn’t mean we can’t occupy the same virtual space. I think virtual workplaces actually offer the chance to place a new emphasis on re-establishing presence, and the idea that everyone can now be together occupying the same space, no matter where their bodies are located geographically. By perforating the perceived boundaries between virtual spaces and physical spaces, we can even stitch the two together seamlessly. Where should architects fit into this new paradigm? Should architects be the ones designing these spaces, or is this responsibility better served by game designers, graphic designers and 3D modellers? Or, since anyone can build their own content in Second Life, perhaps the workers themselves can design their own spaces? What if an architect is asked to design a new building where half of the employees occupy a virtual space and half of the employees will occupy the new physical space? Can the architect help rethink and design the virtual architecture? Or, should their role stop at the bricks and mortar? Here’s another competition in Second Life a group member shared with me tonight. I think these competitions are great, but I’m really looking forward to awards that exceed ‘publication’ or book awards as the grand prize. Don’t get me wrong, publication and competitions are great, but I struggle with the idea that we should all be feeding our hard earned ideas, architectural concepts and imagery to these competitions with no other compensation. Besides, don’t we need new media for this new world? Are ‘books’ really the way we’re going to disseminate our ideas? What about all of the people who open source their ideas about virtual architecture, sharing screenshots and machinima with the existing community in an attempt to spread ideas and concepts as quickly as possible? Surely books have a long tail, but won’t they become essentially obsolete almost as quickly as they leave the press? Honestly, if the state of cutting edge virtual architecture is at the same status 1 or 2 or 10 years from now, I’ll be very, very disappointed. If what we really want to do is gain social currency as thought leaders through publication, or share our ideas, to reach people, to spread these concepts quickly – I think we should agree to share them with each other openly. Many members of the Architecture Group have already spent a great deal of their time and energy posting ideas, essays and screenshots here on The Arch, and I sincerely hope that more of you will consider the same. If the goal of these publications really is to disseminate knowledge and improve the quality of virtual worlds, it seems to me that it would be in their best interest if the content were presented as openly and in as many formats as possible. The immediacy of the blogosphere, combined with the long tail and increased exposure of a physical book might be just the right combination to have the greatest impact. At the very least, we need to do both. Having said all of this, I would like to announce with great enthusiasm (tongue in cheeck), the first annual ‘Arch’ Virtual Architecture and Essay Competition!!! There is NO deadline for submissions – they’re accepted anytime! There is absolutely no requirement for formatting (screenshots, SLurls, essays are all accepted)!!! The prize is… *drum-roll please* publication on The Arch!! !